Thoughts Before Watching: Hell yeah a prequel to one of the most classic fighting Anime’s of all time hell yeah, maybe ill get to see how cool things where before the nuclear apocalypse and possibly how it all came to be…..especially with updated animation, bring it on! Well it’s definitely an improvement compared against the 80’s series but the characters and movements / motions feel painfully stiff. As usual the character designs are very templated but that itself is a common trait of this franchise. Sadly another bad thing is this anime has the look of an old visual novel game where everything looks extremely plain and it feels like someone just did a paint by numbers job on everything…it just looks extremely dull, stiff and bland. Well nothing really stands out at all here, again it just feels bland. I guess the only thing that stood out for me was the extremely humorous moments of engrish which were intentionally there when the bad guys were scheming or celebrating their short lived victories. Op and Ed were forgettable….voice actors were alright and there was hardly any theme or BGM so there is not much I can add there….oh except…the dialogue. The dialogue was either comical, predictable or just campy really and I guess that is due to the content of the storyline which is…erm yeah lets get to that. Alright let me just clear up the need to know stuff. 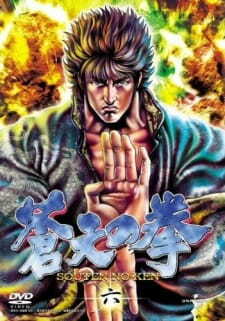 The original 80’s series followed the protagonist Kenshiro (no last name) who was the 64th successor to the Hokuto Shinken fighting style and that story was set in 199x after a nuclear disaster. This story here follows the 62nd successor to the Hokuto Shinken fighting style of which the 80’s character was named after, Kenshiro Kasumi or as they keep calling him in this show “Yan Wang”….this story is set in the 1930’s. The story In Souten no Ken at its core is more about gangster rivalry and territory wars than it is about Hokuto Shinken. Yep that’s right….its like if you took the gangster element of GunGrave and mixed it with FONS you will basically have this show…..so the question is does it mesh well…and my answer to that is….it probably could have if it was taken more seriously. The pacing to the show is another problem….for the first 5 or 6 episodes the show is building up just to get started then it goes through the motions of being more of a comical “hunt down the bad gangsters” story before it goes into another element about lost love. Now I’m not saying these elements are bad they are just written very poorly here and the Hokuto Shinken theme to me just feels like a plot device for the characters to fight each other in this otherwise bland storyline. Also to be honest the main character’s back-story goes extremely unexplained and you get little insight to how he came to be, his master or his training but rather a couple of minor flashbacks of his time as a gangster-helper. Lastly a lot of the story elements feels like it was taken from the original 80’s series and follows a similar template for the most part but the 80’s story is far more interesting and emotionally touching than this…attempt. The range of characters is exactly what you would expect from the FOTNS universe but I have to say I felt the bad guys in this show where the most zany and comical I had ever seen. I mean there was actually a bad guy than had a golden wig heavier then his entire body and he would fall over continuously…which was obviously going to be his downfall (hehe pun). The other Martial artists / rivals in the show had really flimsy and stupid motivations and almost every fight ended up the same way….the bad guy was either “misunderstood” or “clouded”…I mean it got kinda sappy and felt counter-productive but hey it was so predictable after a while I just went with it. Now to be honest the redeeming character for me is Kenshiro Kasumi himself. Unlike the original Kenshiro from the 80’s show this Ken had a lot more personality and didn’t come off as a complete messiah all the time. He has a Clark Kent thing going on at times which was very comical and he seems to like to toy around with people which I felt is more something I would do in his shoes. You can definitely see the similarities between the old and new Kenshiro but their characters are different enough to clearly put them apart. But then again when I think about the 80’s Kenshiro he didn’t have much to be happy about so maybe this is just the Kenshiro that could have been….either way I do like him…but other than that every other character in this show is just darn predictable with a capital P.
Meh overall I can’t say I enjoyed this show that much…apart from Kenshiro Kasumi killing the gangsters in funny ways, which is another constant in this franchise it was an extremely dull story. This show does not really add anything to the universe of FOTNS or even illuminate to anything so it has little value for me except to see some interesting kills and some zany antics from dumb gangsters. I am still waiting to see the Ryuken story as I think that would be an epic tale and a great segway to the original 80’s series…as for this show see it if you’re a die hard fan otherwise PASS on it! My overall thoughts on this anime: amazing ideas that were poorly executed. Having already watched the original 80's anime Hokuto no Ken, I thought I'd give this one a try. This anime had a lot of potential, as the interaction with the gang wars and the destiny of Hokuto make room for an intricate storyline with complex characterization. However, the anime suffered from a rather sluggish storyline and inconsistent animation quality. I've never read the manga for this series, so perhaps it was better able to achieve what was intended. There were a lot of parts where the anime didn't need to dwell as long as it did. There were a lot of fights which would make up an entire episode without driving the storyline. Furthermore, plot holes, inconsistencies (with the original Hokuto no Ken), and a lot of plot threads that weren't adequately resolved. For me, its one saving grace was setting the anime in 1930's Shanghai. Again, just poor execution. Besides an inconsistent plot, the art quality was also inconsistent, ranging from quite beautiful to abhorrent. When the art was good, it felt very much like Tetsuo Hara's style had been faithfully translated into the anime. Characters' outfits were nice and I especially enjoyed seeing Kasumi Kenshiro in a suit. Otherwise, perhaps due to lack of budget, there were too many parts that I could barely watch due to how poor the animation was (and don't get me started on the extra 4 episodes). Overall? I quite liked the animation style, and I wish the animators had the time and resources to fix a lot of it. Sometimes, the sound quality was palpably poor, and a lot of soundbytes were re-used throughout. Otherwise, it didn't really take away from the series. I'm not too sure how to judge this aspect of the anime. There were some scenes in which the way the writers intended to portray Kasumi Kenshiro came out quite beautifully and the distinction between him and his namesake was clear. However, this was too often poorly executed, and Kenshiro was too similar to Kenshiro II. As well, several of the characters feel as though they were rehashed from the original Hokuto no Ken series. Other characters are unclear in what their motivations are and why they're acting as they do. However, a lot of this is at least forgiven through Kenshiro's character growth and Yu-Ling's fine characterization. So overall, characterization largely suffered from poor execution. This was definitely not the best series I've ever watched. There were some parts at which I was only watching for the sake of completing the series. Otherwise, there were other parts I genuinely enjoyed. I think my favourite thing about Kasumi Kenshiro is that his weaknesses are made clear, and he's made out to be a very human character. So overall, my enjoyment ranged between genuine love for this series and wishing to bang my head against a wall. I gave this series an 8/10. Reason being, the worst parts of Souten no Ken were in the 4 unaired episodes. Thus, I'm trying to make a distinction between those and the series that actually aired. With that, I plan to read the manga when I have the opportunity, as there's likely a lot of story that the anime never managed to cover.